Q: Dr. Babizhayev, why does Can-C work so much better than the less expensive NAC eye drops on the internet? A. Please allow me to address this question. Interestingly during our research we found that the antioxidant activities of the released carnosine molecule were dependent upon a highly specific purity factor of the raw material itself or rather, the precise content of the transition metal ion traces. There were vast differences in the cataract reversal results achieved in the trials due to the varying levels of ionic trace mineral levels within the n-acetylcarnosine raw material. This patent protected refinement of our specific grade of N-acetylcarnosine, with the Japanese, is what ultimately resulted in the anti-cataract successes achieved in our clinical trials. It is only this proprietary form and grade of N-acetylcarnosine raw material that will ever be used in Can-C. Equally significant is the extended “half life” of this particular formulation which greatly increases the anti-cataract activity. I am most concerned that when consumers purchase the random n-acetylcarnosine eye drop formulations available in the market place that their poor results will reflect on my research.. Amazingly these companies often reference my research in their marketing efforts even though they have no affiliation with me and are definitely not offering my proprietary N-acetylcarnosine (Can-C™) formulation which the research was based upon. Additionally there is the real disappointment for the individuals who have unknowingly purchased one of these inferior formulations, who were seeking to improve the health of their eyes and who have been given hope as a result of our research. Fortunately there is a simple way for consumers to verify if they have purchased our clinically proven formula as we have placed a hologram on the front of our box to protect against these copy cats. Two (5ml) vials per box Special Discount Offer! Click here to Order! A: “It’s a pleasure to be here in Paris with you Phil. A: We have developed a very precise product with N-acetylcarnosine, both from the point of view of purification, and its content of transition metal ions traces. This is because, rather uniquely, only certain types and levels of impurities enable the maintenance of the peculiar antioxidant activities of the released molecule, including those scavenging the hydroxyl-radical, singlet oxygen, lipid peroxidase-like and ferroxidase-like activities. This very particular active product is responsible for the anti-cataract efficacy, and for the protection of the lens proteins from the singlet oxygen-induced oxidation of the lens protein, specifically the amino acid tryptophan residues, which have been measured using chemiluminescenece technique and L-Gly-Tryptophan peptide. Some details of this were published in one of our papers. (Ed.- see reference 1 below). Q: “So, when you were experimenting with different N-acetylcarnosines, was there a difference in their efficacy, or side effects? Q: “Thus, I imagine, you must have decided upon a specific N-acetylcarnosine with a narrow range of purity, that was, in terms of its impurities, not-too-much, not-too-little. Is that form commonly available? A: “No, that form is not commonly available, and the information is kept proprietary. The specific grade of N-acetylcarnosine raw material used in Can-C™ is manufactured by our Japanese partner under a cGMP specific know-how process. Therefore, this material is currently only available from one source. A: “We have provided a hologram on the front of the packaging to assure consumers that they have purchased the correct formula and to prevent copycats. Q: “Now we understand the importance of the type of N-acetylcarnosine and its purity factor, what could happen if one were to try to change the formula by adding additional ingredients? A: (Innovative Vision Products (IVP) has conducted serious pharmacokinetic studies utilizing precise chromatographic techniques of analysis, and using the final formulated patented product and other various possible formulations. The ratio of NAC concentrations upon the topical application of to the eye, is equal to 9 in the aqueous humor. This means that virtually all N-acetylcarnosine (Can-C™)is converted to the more powerful antioxidant L-carnosine in the aqueous humor. 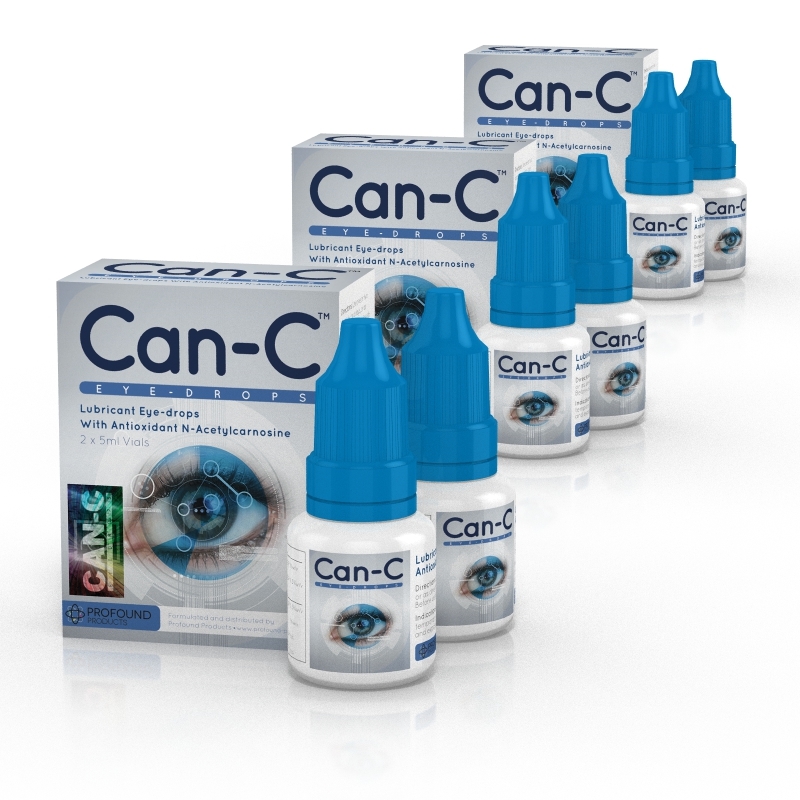 This can then enter the lens tissue and epithelial cells and act as the anti-cataract remedy. The de-acetylation of N-acetylcarnosine by N-acetylesterases and N-acetyltransferases, at the level of the cornea and the conjunctiva, can be inhibited with the addition of other substances to the ophthalmic formulation, substances such as vitamin E and vitamin A. This is because they are endowed with a branched hydrophobic hydrocarbon skeleton. Such formulas, which do not originate from the validated source of 1% N-acetylcarnosine, when applied, can be readily hydrolyzed at the peptide bond site and then allergenic histamine is released because of the peptide hydrolysis with acid hydrolases in the tear fluid. A: “Yes, we believe that our ocular release N-acetylcarnosine will have a role for glaucoma, especially when combined with some other substances that we are currently working on. In particular, we know that N-acetylcarnosine is efficacious for its anti-glare effect and improvement for color vision. So, for example, we envisage that this could lead to safer driving, especially night driving. Q: “Dr. Babizhayev, Thank you for your time with us here today and enjoy the rest of your stay in Paris.